It was in the fall of 2008 when I first enrolled at HCC. I was 18 and working two jobs in order to pay my tuition via installment plan. My mother who was going through a divorce at the time, couldn’t offer me any financial support, and good old FAFSA required me to provide her tax return information. Because she had filed jointly with her soon-to-be ex-husband, who made too much money, I was denied financial aid. By the time the following semester rolled around, I still was not eligible for financial aid and I wasn’t able to come up with the money for classes and books, so I started working dead end jobs full time. My story is one all too familiar to many students who find themselves eager to learn, but too broke to pay for an education. My personal experience fuels my belief that community college tuition should be free for all students. Opponents of free community college education ask the question, “Who’s going to pay for it?” As taxpayers, they do not want to be burdened with the cost of other people’s education. The funny thing is, though, we are already paying for higher education costs through ever increasing tax rates, so in the end, making community college free should make very little difference. In a 2011 edition of Connecticut Magazine state residents were enlightened as to exactly where their hard earned tax dollars were going. Apparently, out of the $4.1 billion spent on education in 2011, only about $800,000 went to higher education. Connecticut is not alone. According to research done on a national scale in 2014 by the Center on Budget and Priority politics, only 13% of state budgets are allocated to higher education. More of your tax dollars go to Medicaid. Essential educational priorities are given very little consideration by state governments. State priorities appear to be a bit disjointed, to say the least. More bad news anyone? A 2010 study by the Georgetown University Center on Education and the Workforce revealed that by the year 2018 more than 60 percent of jobs will require some form of college education. Recently I contemplated making a career change from banking to entry level communications. I started my search by scouring job sites such as Indeed, Monster and SnagaJob. What I found was opportunities for those of us without a degree are slim. Most of the job postings had bachelors degree as their lead requirement. Very few postings asked for an Associates, and the positions that had no college education requirement paid pennies. Clearly society is placing extreme emphasis on higher education to fill a decreasing jobs market, making college more a necessity for those who want to establish a career. Marcin Pienczykowski, a 24- year-old former HCC student said, “I find it stupid that we have a price tag at all on education. Simply because of the fact that we pay taxes, it should be free. The current system puts too many people in debt to get a degree that may or may not be good enough to help pay off that debt. It’s difficult even for middle class citizens to get through college without sacrificing an arm and a leg.”. As someone who works in the financial industry, I see people struggling to put themselves and their children through college every single day. I have seen people borrow against the equity in their homes to pay for college. I’ve seen them work two jobs to get the money, and I’ve also seen them deplete their retirement funds in order to pay for college. Yes, that is right, in this country we make people choose between working until they die or putting their children through school. It puzzles me that there would be any opposition to making community college education free. Ultimately it would cut down the financial burden of going to school by half, if students were to go to a community college and then transfer to a four-year school. Parents and students alike would essentially be paying two years worth of tuition instead of four. This would help keep more money in their pockets. 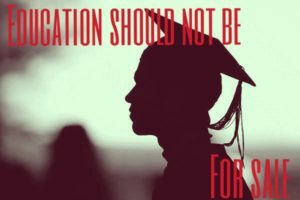 Other opponents of free community college say that education is a privilege, not a right, but if that is so, then why must we spend tax dollars on primary and secondary education? If education is a privilege, does that mean we should cut off all funding to primary and secondary schools and have parents start floating the costs directly from their pockets? President Obama is now hard at work on making free community college a reality with the America’s College Promise proposal. Under America’s College Promise, students who are enrolled part or full time and achieve a minimum GPA of 2.5 will have the opportunity to have their school debt eradicated. Obama’s proposal will not only help cut student loan debt, making education more accessible, but it will help to stimulate the economy by creating more jobs, increase purchasing power, and ultimately help build a stronger, better educated workforce. To learn more about the President’s initiative to make community college education free and accessible go to whitehouse.gov. It is absurd that students are graduating with hundreds of thousands of dollars in student loan debt that will take them most of their working lives to pay off. If you would not take the right to have free education away from K-12 then we need to stop picking the pockets of those who seek higher education.